I have hooded eyes which can be annoying when you try to perfect your cat eye or smokey eye and it doesn't turn out the way you want it to. I know how you feel and if you have another eye shape, don't worry some of these tips may help you too. It is important to see a primer or base shadow, especially with hooded eyes as it is much easier for eyeshadow to crease and slip. I like to use Maybelline Colour Tattoo Gel Eyeshadow as it acts like the perfect base. It acts like a primer since it is a cream like eye shadow. I wish I had learned this a few years ago. Do your eye makeup with your eyes open and mirror parallel to face. There's not point in spending ages trying to do a beautiful cut crease when you look straight ahead in the mirror and realise you can't see your beautiful work. Two actress that I love that have hooded eyes are Jennifer Lawrence and Emma Stone. I feel finding a Celeb that has a similar eye shape as you can give you inspiration to what may suit you. I think it is a simple and easy way to see what works. 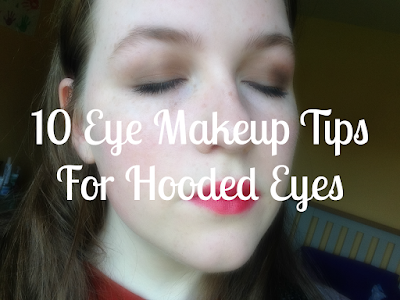 If you have hooded eyes and put a crease shadow into your crease, you won't see it. Put it in your crease and slightly above it to make sure it can be seen. This may sound weird but if you set your foundation with powder to make it last why not use it for eye shadow. I find this helps with the longevity my eye makeup as I use it beofre and after I put on any eye shadow. Waterproof mascara is a must for me as otherwise by the end of the day I have panda eyes. It can be a pain it take off but it is worth it. I try to look for products that state they are long lasting as then they should last for more than two hours on my face. I know there are some brands that have amazing products for very cheap but there are a lot of other brands who can't hit that mark. When I mean cheap, I mean €1-2 on a product cheap. I personally haven't been lucky enough to find any of this makeup to ever work for me. This never turns out well. Try to avoid extending the wind of your cat eye over your crease. It makes it look droopy and misshaped of you so. Try to extend further out and away from the crease as it looks much better. I've heard this one a lot but I don't always use it. I sometimes like using shimmery or satin eye shadows but if you use in moderation it will look wonderful. I think it is so important to experiment with eye makeup to see what suits you. I used to only wear eyeliner as I was too afraid to start using eye shadows but now I'm the opposite way around. I love trying out different techniques and different colours to find what looks good. What are you eye makeup tips? By the way, I love the direction you are going with your blog design! It looks so sharp! Thanks for commenting Guilianna! I'm glad you find this post helpful, I enjoyed writing it. I hope you enjoy the dance. I've been trying to change my design little by little as I like to change things up a bit. Thanks for commenting Libby! I know the struggles.